This year, Valentine’s Day falls on a Friday. That gives corporates a terrific opportunity to organise something on Valentine’s Day. This I am favouring corporate picnics for Valentine’s Day. They fall within a romantic theme, but work well for corporates. This is quite easy to coordinate. If you have a large budget, buy wicker picnic baskets for clients or staff and fill them with delicious Valentine’s Day treats. Then get large picnic blankets which can be laid out in a court yard, in a sectioned off part of the parking lot etc. Most baskets come with all the plates, glasses and utensils for two to four people, so you don’t need anything extra except your food. Even a lunch cooler filled with Valentine’s Day treats will work well. Hire a whole bunch of plants from a décor company or a nursery to create a little sectioned off piece of paradise. Be sure to choose plants that are of different heights to create a natural feel. Get some tranquil music which you can play over a portable CD player or hire a sound system. Include in your basket a love song CD that your guest can take home with them as well. If you have a lower budget, get platters from a local Spar and give each guest a sandblasted champagne glass with miniature personalised champagne bottles as a Valentine’s Day gift. We have a big demand for personalised wine as promotional gifts. After all the yummy treats, why not and out to your guests some banded mint tins, which will be an excellent Valentine’s Day gift that will be used a long time after your Valentine’s Day corporate event. There are some many ways that you can celebrate Valentine’s Day with your clients and staff, just use a little imagination and you can spread some love this Valentine’s Day. For more ideas for Valentine’s Day Gifts, contact Belle Regalo on info@belleregalo.co.za or call us on 082 948 7461. Why is a Conference Bag still a Good Corporate Gift? corporate gifting market. Conference bags are use over and over again giving them an excellent cost per impression rate. With proper thoughts, your firm can still get good mileage out of conference bags. When I started out in the industry, you had the “huge” selection of navy or black conference bags to choose from. Anything else had to be custom made and so this conference bag option was reserved for the best planners as the lead time for custom conference bags was so long. Nowadays there is a much wider selection of stock conference bags in a wide variety of colours. If you get a good and functional design, the conference bags will be used again and again. With many more affordable laptop packages available, through cell phone packages and or though leading banks more and more people are using laptops and tablets. That means mobile offices are now no longer a futuristic visions, they are available now and here. This has greatly increased the use of conference bags and laptop trolley bags. I personally use the ladies laptop handbag. 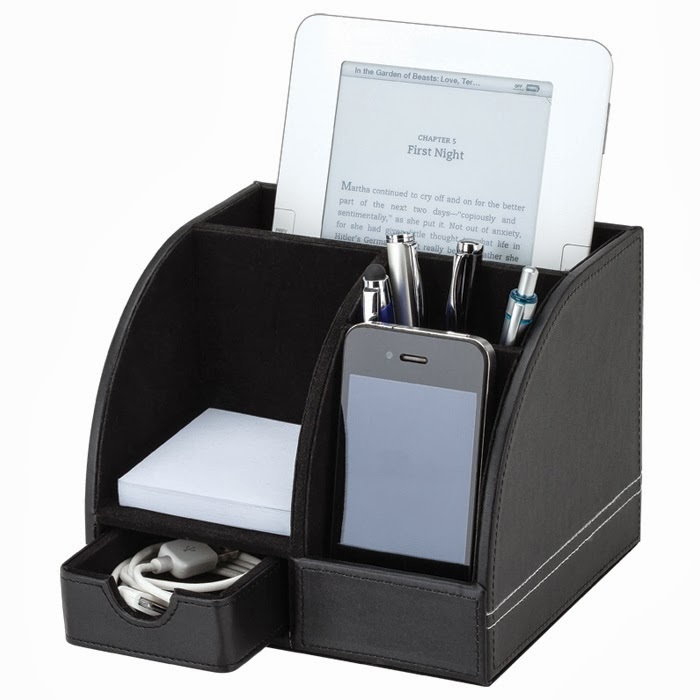 It has a compartment for a tablet, a small pouch for my personal items such as a lipstick, pens, a coin purse, etc. It carries a 17ich screen laptop and I also can fit a 3 presentation folders in it. If I remove the laptop and only use an IPad, I can also fit our rather bulky corporate gifting catalogue inside it, as well as a small cosmetic bag and my hairbrush, making it the ideal mobile office bag for a female executive. When choosing a conference bag or laptop bag, think about the following: Who is person receiving the conference bag? Are they an executive or are they at a managerial level. If it is a top executive, then they will not be reusing a basic document bag. 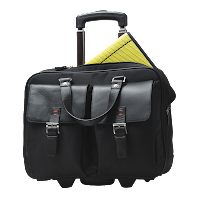 For an executive, you can consider the leather laptop bags or a lower cost yet still executive looking lichee conference bag. What kinds of activities will be at your conference? If it is a long conference with lots of workshops and note taking, then choose a conference bag that has pen compartments, enough space for files and a side pocket for a water bottle. If there are masses of large files at big policy making sessions, then a trolley bag will be a better option for the delegates at this type of conference as no one wants to lug around huge files over the course of a conference using a shoulder strap of a conference bag. Do you want your brand to have repeat viewing? 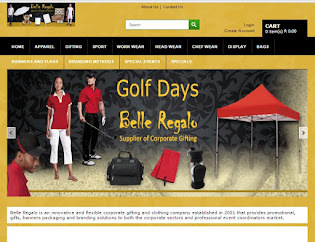 If you are only interested in your bag being used at the event, then you can go for a lower budget. If however, you want this bag to have longevity, then spend more on a functional conference bag that can be used frequently. I personally like trolley bags for this purpose. One with a small branding plaque, which is subtle enough for an executive to be prepared to use again, but still gives your brand presence. The reason that I like laptop trolley bags is that some of them can also be used as overnight bags for a short business trip. I like Europa Laptop Trolley Bag. 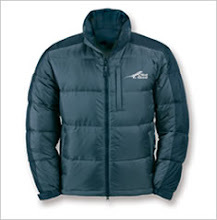 It has a great stylish look. We have engraved logos onto bags before and this also gives a subtle branding. What is your budget? Balance your budget with the impression that you want to create. Rather spend more on one great item than give out lots of little cheap items. Remember that for the duration of your conference all these delegates are going to be walking billboards advertising your product. If you were a stranger passing by, what would you think of the company whose logo is on those conference bags? 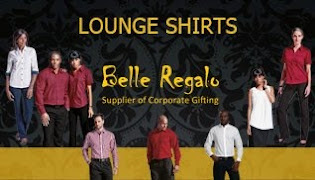 For more information about corporate gifts for conferences and exhibitions, contact Belle Regalo on info@belleregalo.co.za or call us on (011) 593 2450 or 082 948 7461. The adage meetings mean business might sound like a cliché, but it’s the absolute truth of the matter. Networking at events lays the groundwork for excellent business deals. Some of them are even singed at the venue. While there is strong growth in website and other digital marketing, people do feel safe when dealing face to face with people. You get to see if the person’s smile is genuine, if their handshake is form and get a better understanding of the person that you will be doing business with. Here are some ideas to enhance the experience of the visitors and delegates at your conference or exhibition. Name cards on lanyards meetings are vital. Sticker badges say “tacky, unprofessional.” They will disappear for good when the sweater is put on or removed, and they can’t and won’t be transferred to new garments on the following day. We have all heard of presenters who have had their entire hard drive was wiped just as they are about the present at an events. Memory sticks or USBs not only give you the opportunity to give a small conference gifts but they also allow you to add the presentation to the USBs, so that the conference delegates can re-print the notes afterwards. In addition, they make excellent back-ups for presentations. If you have the budget you can have a custom USBs moulded into the shape of one of your products. This definitely sets you apart from the rest. Business card holders are not often thought of as many people believe that delegates have their own business card holders. But I have fund it invaluable to have an extra card holder as this allows me to put the business cards of all the delegates that I would like to keep cards of. This practical corporate gift that you can use again and again. If you have a refreshment stand, why not handed out a free coffee mug or branded glass at the stand. If this is a bit above your budget, then have disposable branded coffee sleeves to put around your disposable cups, this will show off your logo and attract more people to your stand. Notebooks are a terrific conference and exhibition gift as they allow delegates to take notes of the stands that they likes or people that they want to reconnect with. I have often written a note on the back of a card in the hope of looking at it again and have forgotten where I put the card, so a notebook would be great way to relook at the notes made at the event. By the end of an exhibition all the shopping bags that countless companies hand out, start to dig into my hands and so one of the best exhibition gifts that I receive was a luggage spotter handle. They make holding a whole bunch of shopper bags filled with catalogues, so much more comfortable. At another exhibition that I attended a stand sold trolley bags with their logo on. People flocked to this stand to relieve them of their stock. Some exhibitions do not allow the sale of products, but perhaps you can arrange for your top clients to stop by and get their free trolley bag or you can have an hourly lucky draw for conference bag. Over a 3 day conference you would only need 25 trolley bags for a competition. These are add onto the normal conference gifts such a conference bags, conference folders, pens, stylus pens, trolley bags There are so many conference gift options to choose from, but the ones mentioned in this article solve some of the practicalities that need to be take care of at an event. 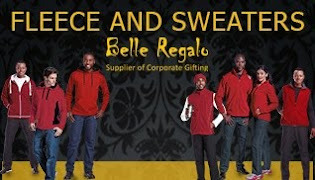 For more information about corporate gifts for conferences and exhibitions, contact Belle Regalo on info@belleregalo.co.za or call us on (011) 593 2450 or 082 948 7461.